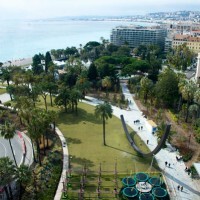 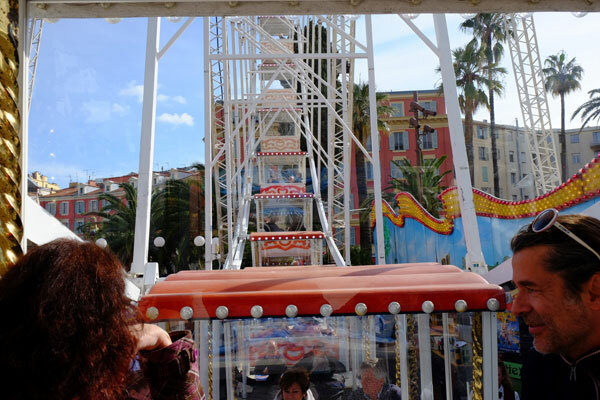 Vira La Roda, created by talented Niçois chefs, made the Great Wheel go round for two gastronomic lunches up in the sky with gorgeous panoramic views on Nice. 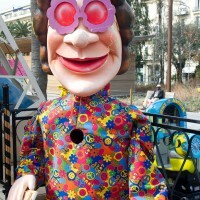 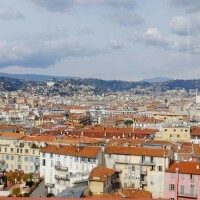 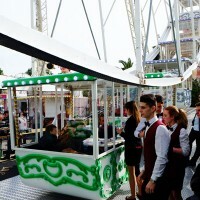 Vira Roda (turn the wheel), an association of chefs of Nice, talented and starred, proposed an extraordinary culinary experience: to boarding a nacelle of the Great Wheel to enjoy a gourmet lunch while flying over Nice and the Carnival at 44 meters in height. 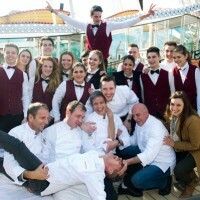 A unique experience combining culinary delights and sumptuous views. 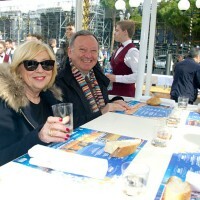 Vira La Roda was born on the initiative of Christian Plumail, chef of L’Univers in Nice – who has just opened a table d’hôtes in his apartment. 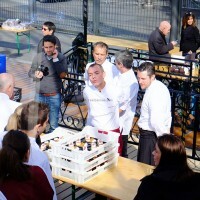 The idea inspired David Faure, chef of L’Aphrodite – who leads the Toques Brûlées – always enthusiastic for a lively gastronomy that makes the show, and pastry chef Serge Serain. 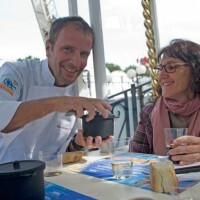 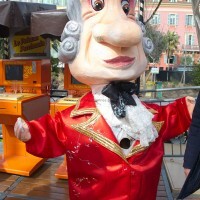 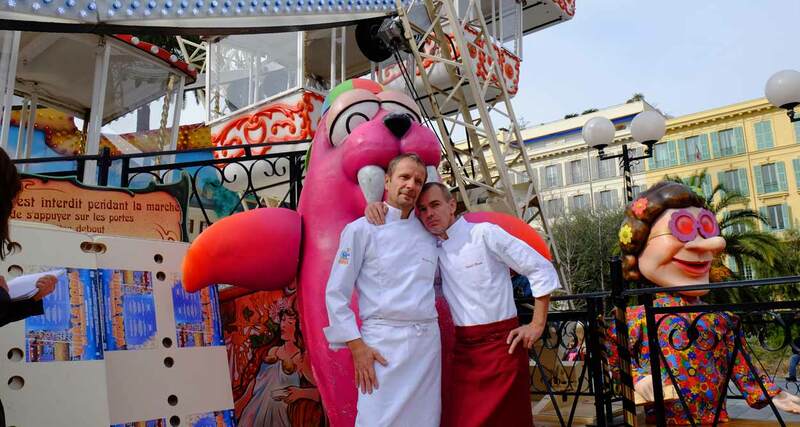 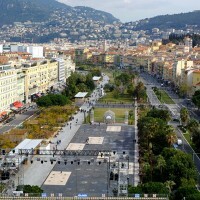 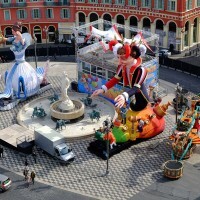 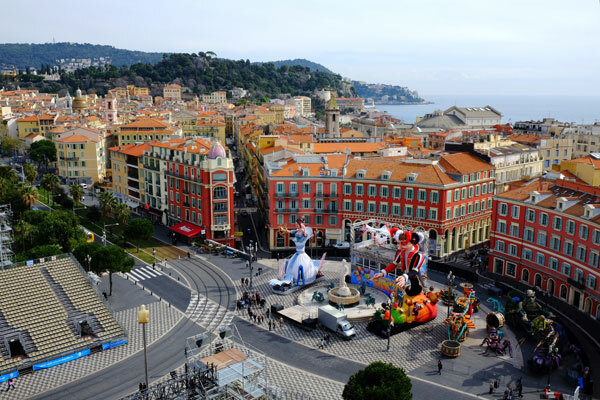 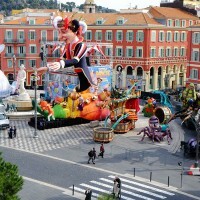 As last year’s first edition was a great success, they organized with other chefs from Nice, two charity lunches during the Carnaval de Nice in 2015, on Fridays February 21 & 27, 2015 aboard the Great Wheel overlooking the Place Massena. 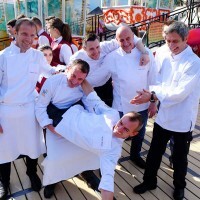 This year’s lunches were prepared by the chefs: Christian Plumail (L’Univers), David Faure (Aphrodite), Gilles Ballestra (Le Luna Rossa), Frédéric Galland (Le Parcours), Cyrille Billa (Les Sens), Serge Serain (Pâtisserie Cappa). 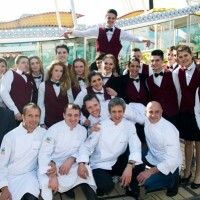 Young students of the Nice Hotel School have provided excellent service as the nacelles were going round. 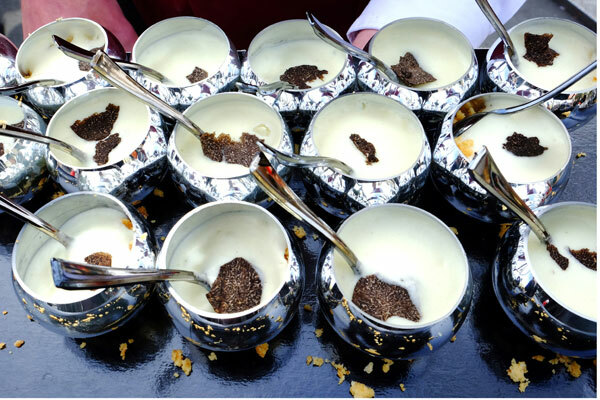 As an appetizer before taking off, the guests began with a delicious amuse-bouche with truffle signed by Christian Plumail and Cyrille Billa, accompanied by a glass of Champagne Taittinger. 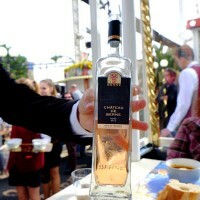 The passengers of the gastronomic flight Vira La Roda then got in a nacelle – four around a central table – and were served wine and rosé wine from Château de Berne. 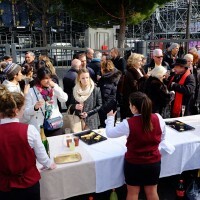 After a few revolutions to embark guests while balancing the wheel, a first passage saw the entrée served: “Low-temperature cooked Cuttlefish, Aniseed Bolognese of Tentacles with Chorizo” by Frédéric Galland. 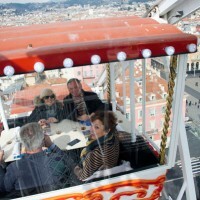 Between each course, the wheel was moving between different heights, enabling to taste the dishes while admiring panoramic views of Nice with the King and Queen of Carnival 2015, the roofs of Old Nice, the Coulée Verte, snow-capped mountains in the distance… David Faure then made us enjoy a succulent “Farm Poultry Thigh in Tapenade and Seasonal Vegetables à la Niçoise”; washed down with Chateau de Berne and Chateau Thuerry Red wines. 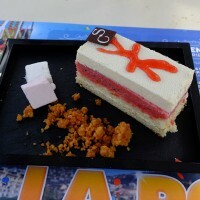 A few revolutions again then, before discovering the dessert, always in the heights: “Melting Ivory fragments with Strawberry Gelée on its Desire Biscuit”. 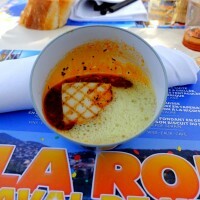 Vira la Roda aims to support young restaurateurs who begin or who are facing financial hardship during their career. 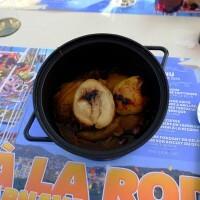 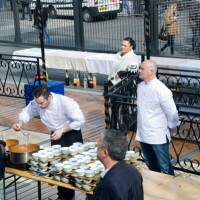 The lunches were carried out in collaboration with the Nice Office of Tourism. 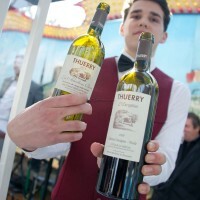 This original, joyful and colorful gastronomic event was supported by the following partners: Pavillon Traiteur, Vignerons de Bellet, Champagne Taittainger, Syndicat des Trufficulteurs, Métro Nice, Chateau de Berne, Chateau Thuerry, Diamant du Terroir, Fournil Borriglione, Socca Dezordo, La Fête du Golfe, Elis Riviera.